Summary: This route is a classic from Glenridding on the bank of Ullswater to Helvellyn which rivals Scafell Pike for the accolade of most visited Lake District mountain. 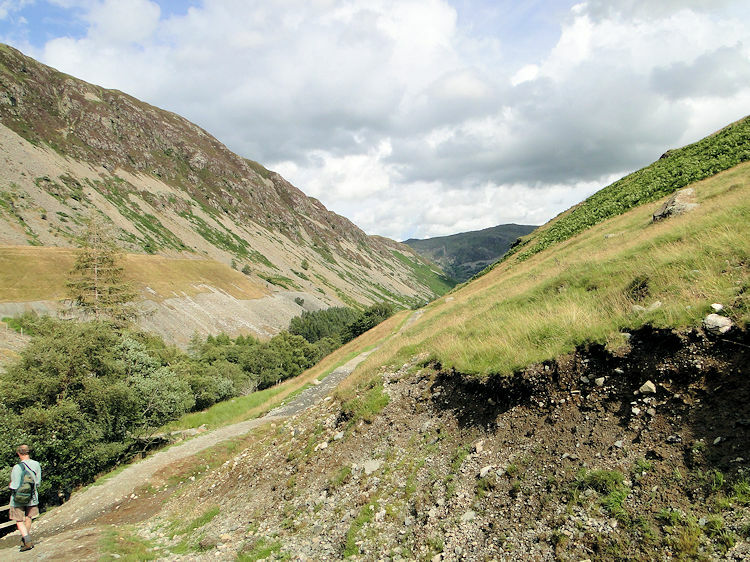 The reason for its popularity is simple; there are a number of fantastic routes to access it from all directions - from the north there are many options including Sticks Pass and White Side, from the east via Patterdale or Glenridding which is our way on this walk), from the south via Grisedale, Dollywaggon Pike and Nethermost Pike and from the west via Wythburn and Birk Side. 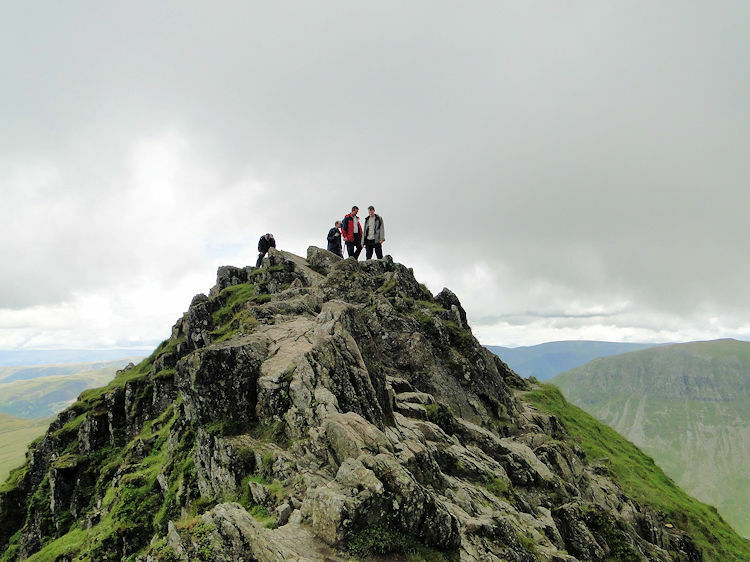 I had climbed Helvellyn from many directions but not this one and as it my friends and I another crossing of Striding Edge it was a delight. 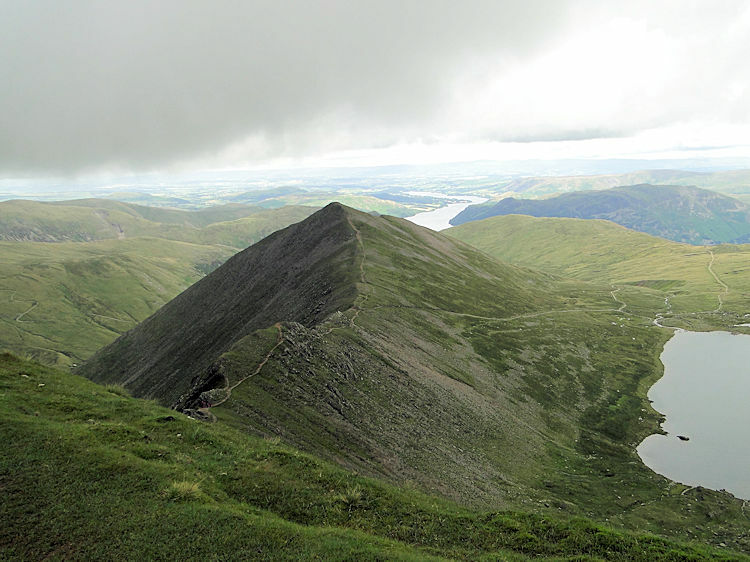 Even more so since we also crossed Swirral Edge which was a new adventure for me. The Walk: After arriving in the Lake District and doing the Gowbarrow Fell walk the previous day Dave and I found our accommodation in Penrith, settled in, went out for a few beers in town and late in the evening were joined by Steve and Chris who had driven all the way from Hampshire to join us. A few beers later we were all suitably merry and looking forward to this spectacular walk. After sleeping off the ale we took a hearty breakfast with Allan and Moira, our lovely hosts at Glendale Guest House (highly recommended - stay in Penrith rather than Keswick or the Lake's honey-pots, much better and much cheaper) and after breakfast we drove to Glenridding and met up with Chris's friend Rick before setting off from the car park in the village towards Rattlebeck Bridge. It was a wet morning and raining as we set off on our journey but with fortune favouring the brave the rain, constant since dawn, stopped as we descended to the bridge. The Lakeland weather was being very kind to us. 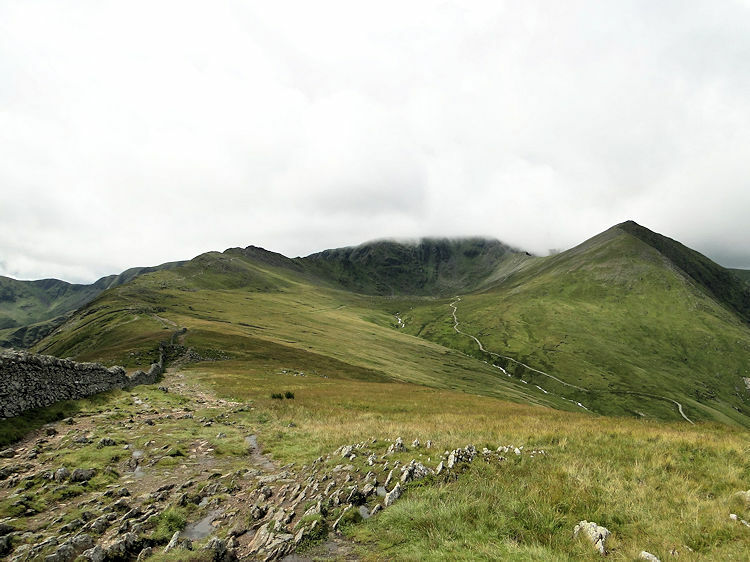 Our planned route for the day was to climb from Rattlebeck Bridge onto Birkhouse Moor via Mires Beck before crossing Striding Edge to Helvellyn with Swirral Edge and Catstye Cam as further targets. Our first obstacle of the day proved trickier than we imagined. The recent rainfall had swelled the normally placid beck and the path crossing just up from Rattlebeck Bridge was not easy; for some that is. I bounded over without much thought, the best way to do it but others hesitated, particularly Dave and Steve who seemed an age deciding on which point to cross. It was fun watching from above but after some trial and error they made it safely across. We continued on. After the not very precarious but challenging crossing of Mires Beck we ascended the fell in a line, Steve leading as usual with the rest of us in line behind. Even after yesterdays warm up on nearby Gowbarrow Fell the brothers Brockhurst held up the rear, my excuse being to take frequent breaks to look back at Ullswater which was unveiling gloriously with every metre gained. After taking in the scenery and the photographs we carried on to eventually reach Steve and the lads waiting at Little Cove. After a short break and a further half hour of toil we reached the crest of Birkhouse Moor, leaving views of Ullswater behind us but the loss richly compensated by our first sight of Striding Edge. Ominously clouds were rolling over the edge and continued to do so as we approached Hole in the Wall. When we got to the hole a rainstorm which we had seen brewing in the south reached us so we decided to don the waterproofs, batten down and take a bite to eat while sitting it out. 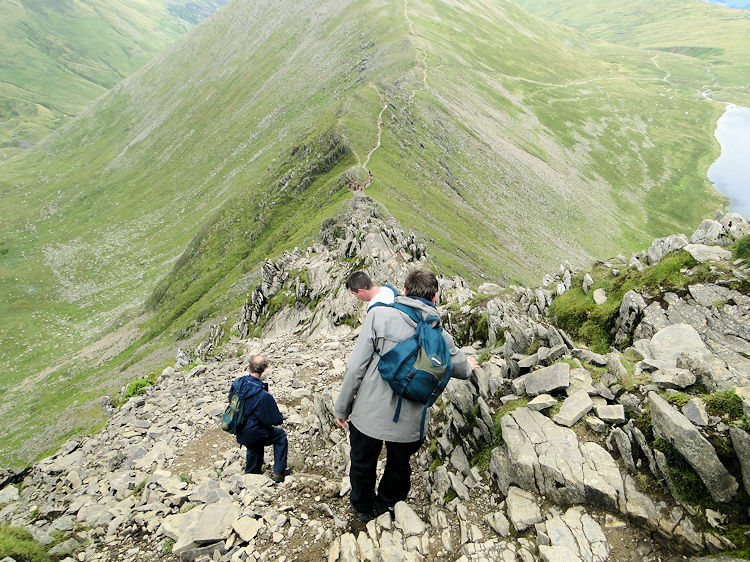 It is never fun on Striding Edge without clear views ahead. We waited for relief in the weather. So did another walker who reached us as we waited; he too took a food break at Hole in the Wall. 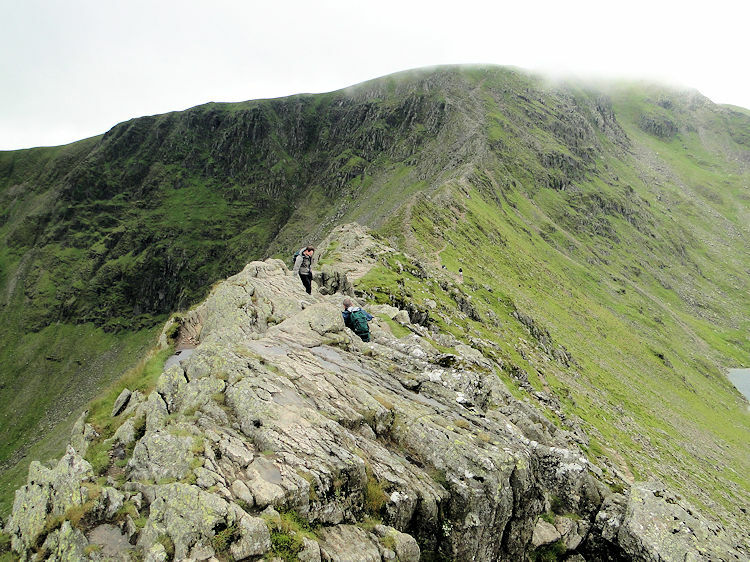 Despite the rain interlude which is always heavier at height we all remained in good spirits and our excitement of the crossing of Striding Edge was heightened when the clouds cleared revealing a clear sight of the entire ridge. Off we went with aplomb. Another incentive to strive over the edge was to catch a sight of Prince William who was ahead of us on the very same walk with teenagers from Centrepoint. Alas we never did spot the royal hiker. 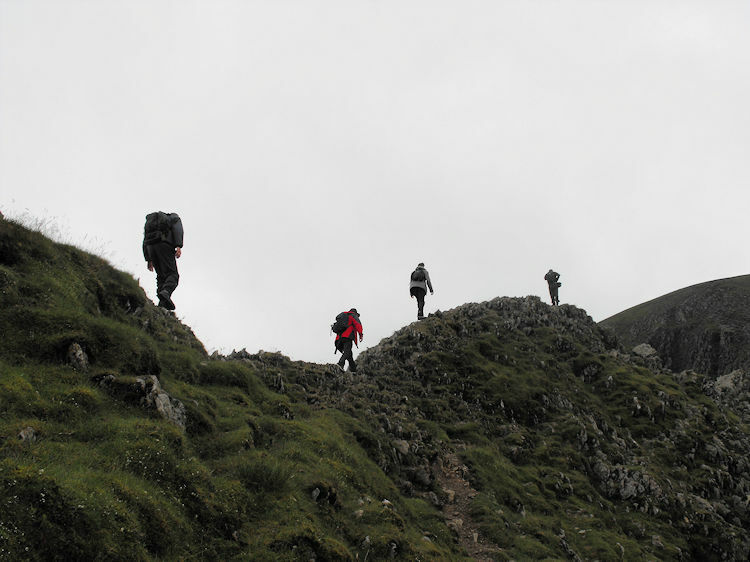 Forgetting the celebrity ahead we all made our way confidently over Bleaberry Crag and Low Spying How before negotiating the narrower band of Striding Edge to High Spying How and the memorial cross. We had fun making our way along the route which included a few dead ends. Rick, Chris and I often took turns in the lead with Dave and Steve enjoying themselves following on. We kept close quarter until after the dip following the memorial and then we split off to make our individual final ascents to the Helvellyn plateau, I went right and scrambled my way up arriving first to be followed by Chris and Rick. Dave and Steve on a third option brought up the rear. We all arrived on Helvellyn safely. 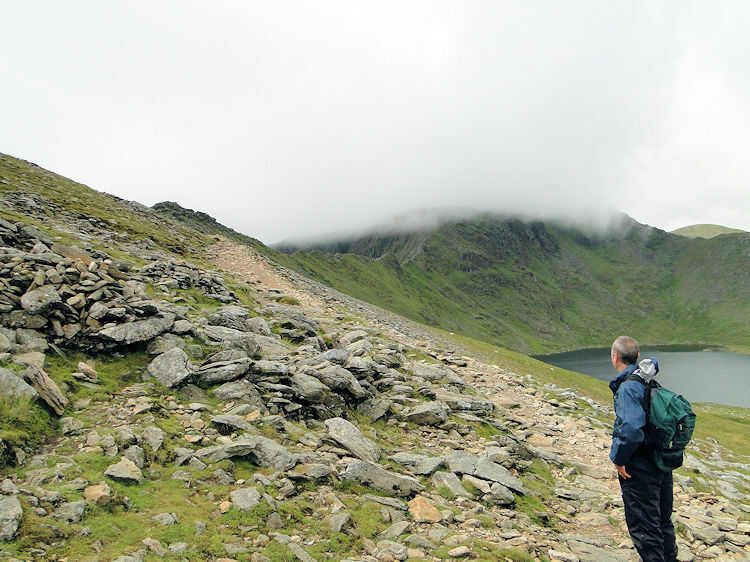 After our individual scrambles up the last pitch from Striding Edge we all met at the Helvellyn summit cairn. Fortunately the cairn was just being left by about 30 mountain guides on a training walk. Phew, we had the busiest walkers crossroads in the Lake District to ourselves... or so we thought; it was not so - two pesky sheep took a liking to Chris and Rick's tuck boxes. 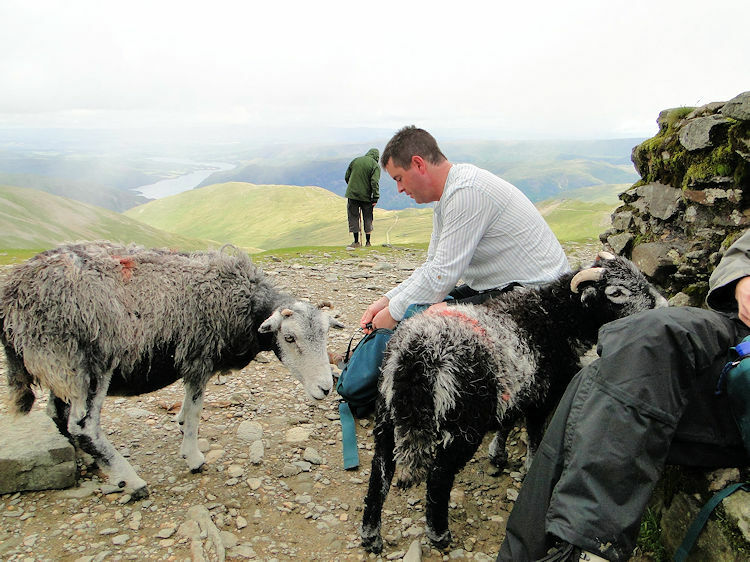 Despite the attentions of the gregarious sheep with unusual appetites we relaxed on the summit of Helvellyn for some appreciable time. There was no hurry to leave, rain was well past and a lovely afternoon beckoned. Thrilled by the walk so far and excited by the walking to come I chilled out in the company of good walking mates; it was one of the special walking moments I always enjoy. Fellow walkers reading this will now exactly what I mean. Anyway, enough of that, let us get going and continue the walk. 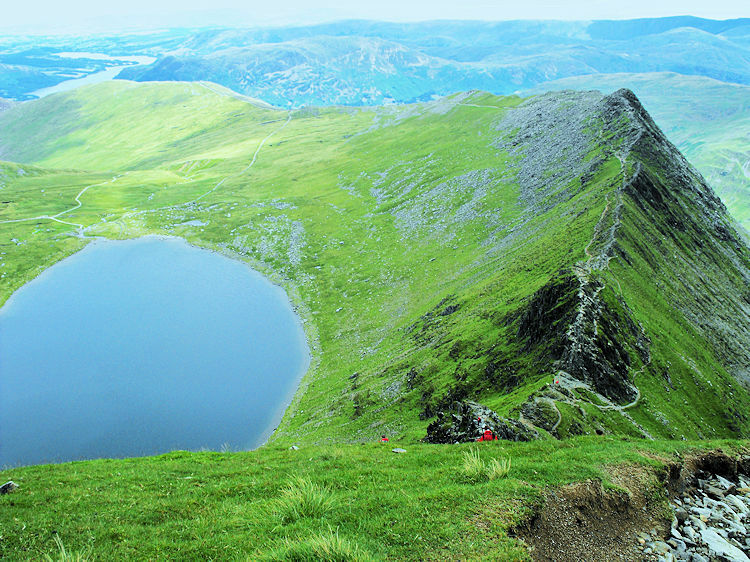 Striding Edge and the summit of Helvellyn were not new to me or to my walking colleagues. Most of what was to come was new though. 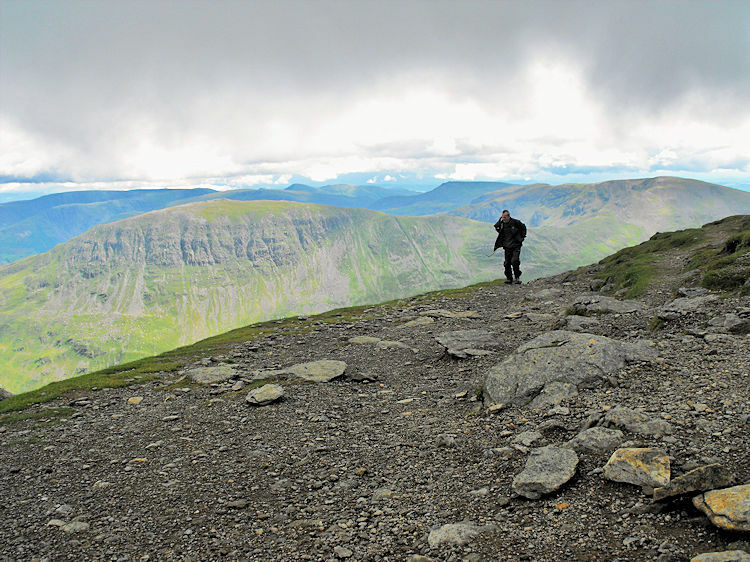 I personally was now entering new walking territory and that started with the immediate descent off Helvellyn onto the Swirral Edge band. Not nearly as celebrated as its neighbouring edge to the immediate south Swirral Edge was nonetheless a challenging adventure. The first part of the descent was particularly technical with scrambling required and on the pitch down Dave took a slight tumble. He was unshaken but a little scuffed for the experience. After the intricacies of Swirral Edge I led the way up Catstye Cam, a wonderful pyramid like mountain with a profile that Wainwright favoured. He wrote "It has nearly, but not quite, the perfect mountain form, with true simplicity in its soaring lines, and a small pointed top, a real summit, that falls away sharply on all sides" It is a beautiful mountain and we all, bar Dave after his mishap, scaled to the top and then paused to take in all of the magnificent views from the summit. Yet another magical moment on a magical walk. 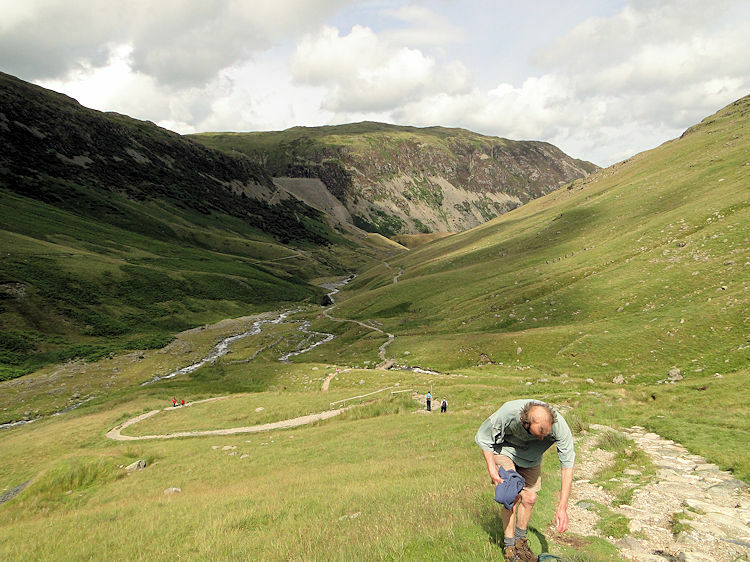 After the thrill of Catstye Cam we headed down off the southern slope near to Red Tarn to follow Red Tarn Beck to Glenridding Common. We all were in fantastic spirits as we strolled along the common in super warm afternoon sunshine alongside the beck and often thrilled by small waterfalls along the way. 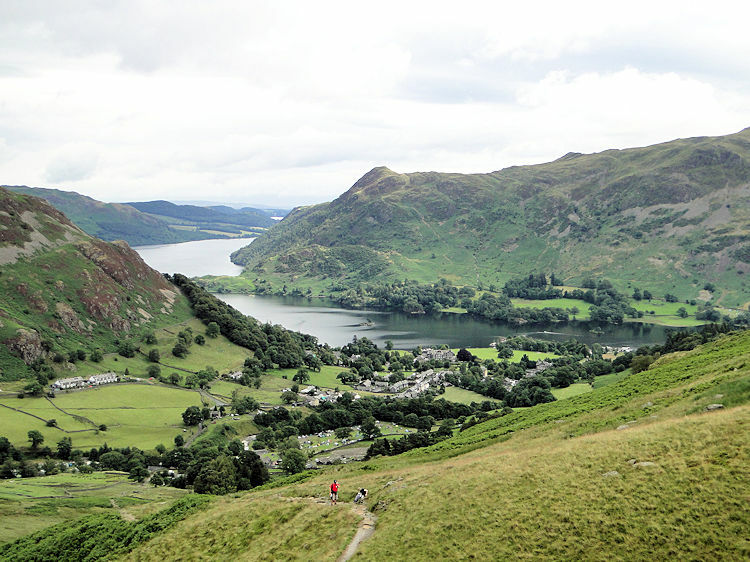 Glenridding Common was simply wonderful. Too soon we reached Glenridding Youth Hostel which heralded our way off the open fell and along an enclosed unmetalled track for a mile back to Glenridding, easily the least inspiring mile of the walk (in retrospect I would follow the alternative parallel path to the south if I were to do this walk again). Despite the bland finale the walk had been fantastic and the company fantastic too. Back at the car park we all agreed it had been a great walk. 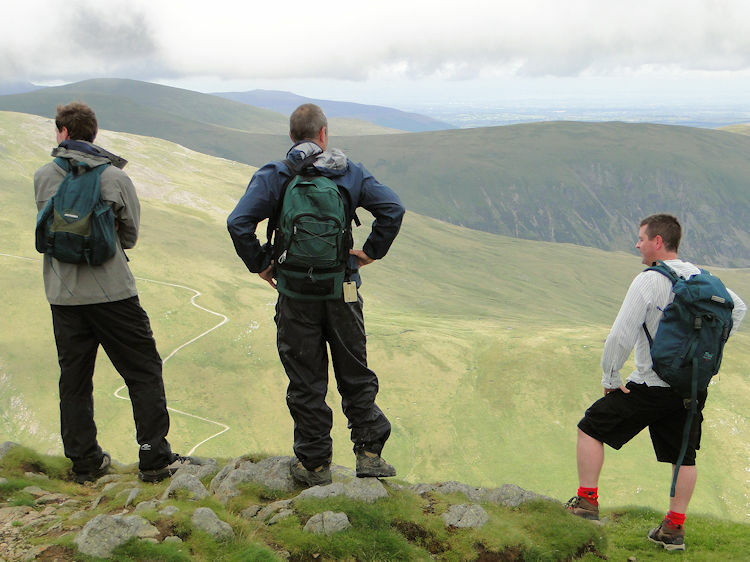 Next up another good night out in Penrith then the Coledale Horseshoe. Could it be anything as good as this true epic?